Utilize your cupboard with our front loading system that keeps up to 20 small cans organized and easily accessible. Adjustable width (19.5" at its widest) *Connect additional cansolidators to expand horizontally. Keep up to 40 cans stacked, organized, and right at your fingertips with our medium front loading system. Adjustable width (20" at its widest) *Connect additional cansolidators to expand horizontally. 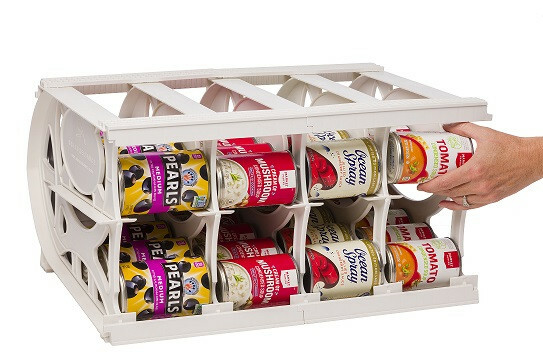 Keep up to 60 cans stacked, organized, and right at your fingertips with our large front loading system. Adjustable width (30" at its widest) *Connect additional cansolidators to expand horizontally. To determine which can size(s) you'll be storing, please refer to our can sizing chart.